Pat Peake was Washington’s first-round (14th overall) in the 1991 NHL Entry Draft. He debuted with the Capitals in 1993-94 and put up a promising 11 goals and 29 points in 49 games. Injuries, illness and misfortune crept into his game over the next couple seasons, preventing Peake from reaching his potential. He was a gritty, sturdily built forward with good hands who seemed destined for some 30-goal seasons in the NHL. But a devastating heel injury suffered on a race to beat an icing call in the playoffs against Pittsburgh in 1996 eventually led to the end of his career. Peake worked doggedly to recover from that injury, but played only five NHL games after the incident. He announced his retirement on Sept. 1, 1998. 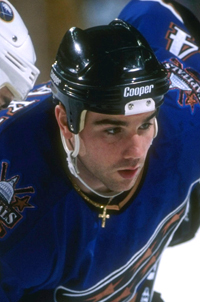 Peake came through town recently and we had an opportunity to sit down with him and discuss his days in Washington, life after hockey and his memories of the incident that ended his career. When you were in junior hockey, you were the MVP of the league your last year in Detroit. What was that experience like? What were your thoughts when the Caps drafted you in the first round? Your first two years you had a lot of trouble with injuries, even before the heel thing. You had mono and a fractured larynx, too. "So I flew into Boston and caught the little puddle-jumper to Portland. I get into Portland and there’s a phone call for me. It’s Jack Button and he says, ‘Get back here. You’re in the late stages of mono, Get back here, get back home and lay in bed.’ I turned around and got on a flight and came right back. That was the lockout year. I think I played 18 games, it was just horrible. "Even the year that I played good – I had 17 goals I think in 62 games – there was still an injury here and an injury there. I could never ever string together [a bunch of games without getting hurt]." I seem to also remember you and Kono getting into a fender bender. Did you drop a TV on your foot, too?